Creating a space to relax and rejuvenate has been on my list for a long time. 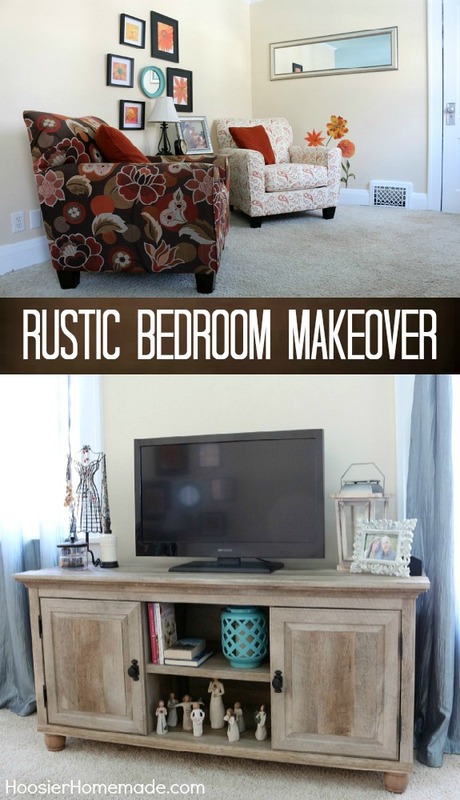 This Rustic Bedroom Makeover is tranquil, yet full of color and fun. I’m super excited to share my bedroom makeover with you all! 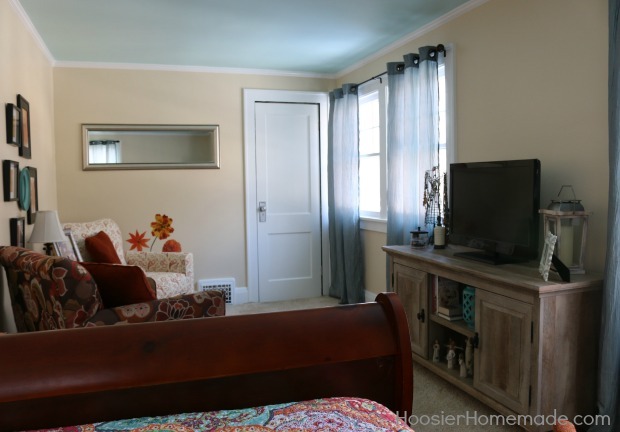 We will be sharing our Rustic Bedroom Makeover in three parts, today is all about the basics – ceiling and walls being painted, new curtains, and furniture. Coming soon will be closet organization and then the bedding. There is a lot to share, so let’s get started. This bedroom makeover has been a long time coming. When we moved into our home 8 years ago, two of the boys shared this room. 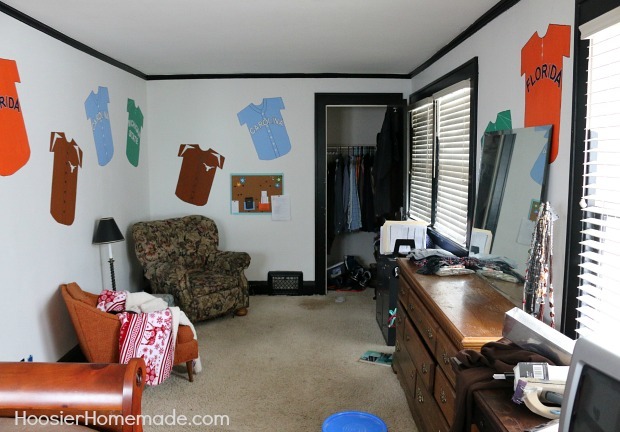 We painted college jerseys on the walls, and all the trim and 1 wall were painted black. About 3 years ago, our middle son made a bedroom in the basement, so my youngest son and I switched rooms. For a couple years, Doug had his office in this room also, until we moved his office to the studio. So, as you can see, there was a lot of work to be done covering the dark paint with sealer. I knew I wanted the room to be bright, but still tranquil. And of course, I love rustic decor, so that was a must. 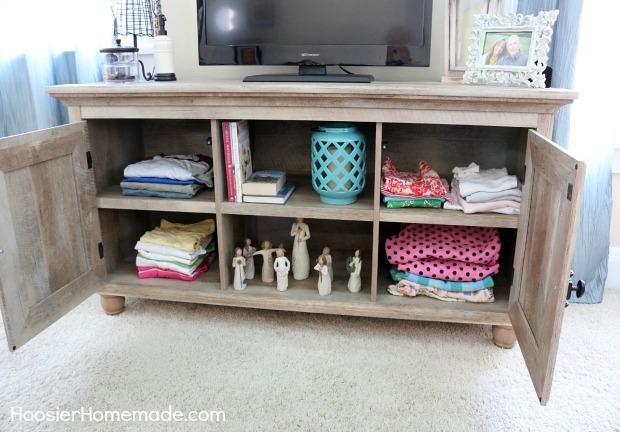 I have had my eye on this Better Homes and Gardens Crossmill collection TV stand for awhile. It worked perfectly in the space between the windows. To add a little pop of color, I found the Better Homes and Gardens blue ceramic hurricane. And then added some books and my collection of angels. The wood lantern that I used in our Fall foyer decorating found a new home on top and a new photo of Doug and I. 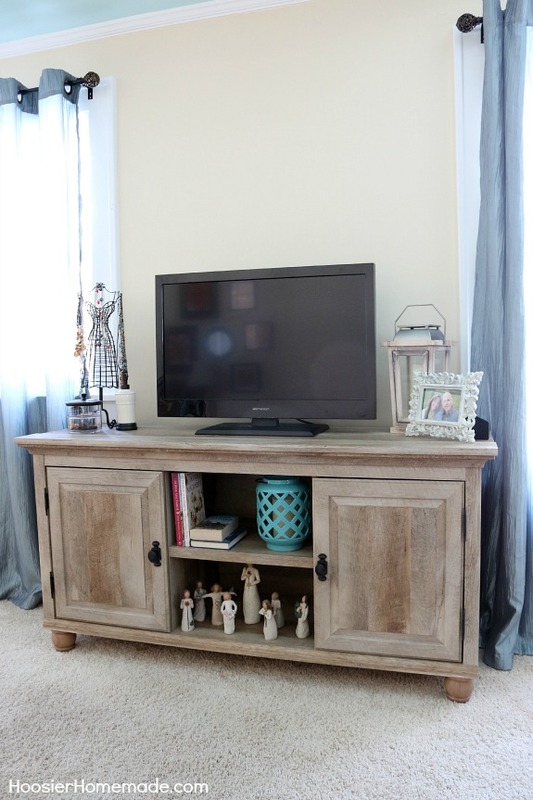 Although this TV Stand is designed for a Family Room, I think it works perfectly in the bedroom. The shelves are great for clothes, and with the closed doors, no one will ever see them. I was also in need of somewhere to hold jewelry, so I thought outside the box, and headed to the bath area at Walmart. 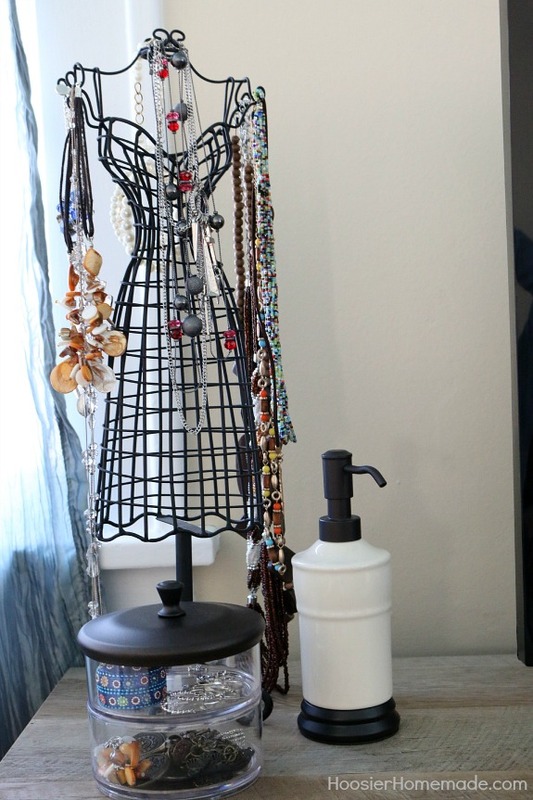 This double stacking bathroom storage canister works perfect and the lotion pump is a pretty way to keep the lotion out and accessible. The original blinds were fine, but I really wanted a softer look. These blue crushed taffeta window panels worked out perfectly. 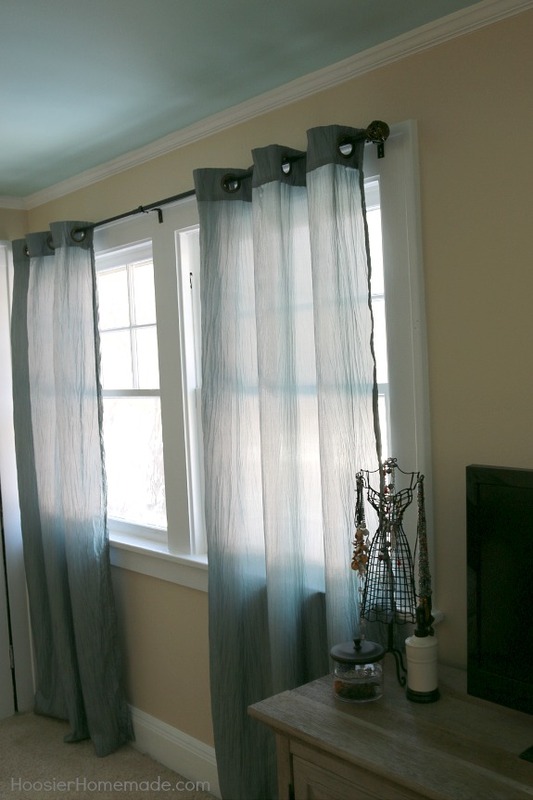 The decorative drapery rods add a touch of class. 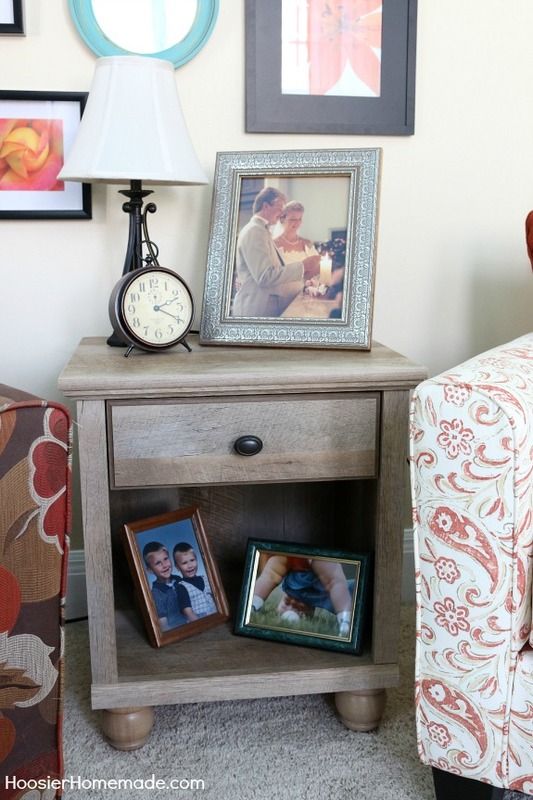 In between the chairs, we added the Better Homes and Gardens Crossmill collection end table to match the TV Stand. 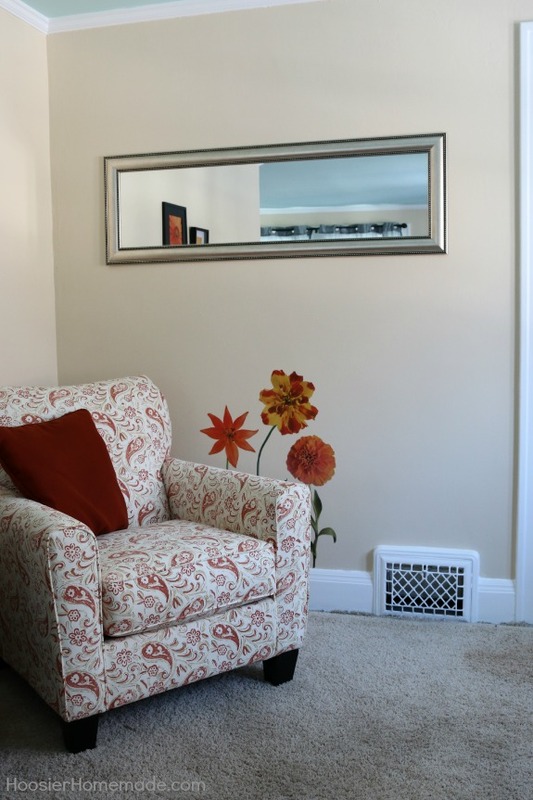 An accent lamp, a metal clock and the picture frame add some warmth to the room. They are all from Better Homes and Gardens line at Walmart. 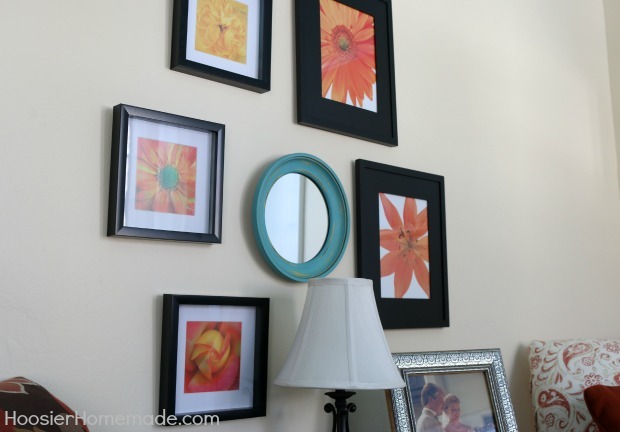 We pulled all the photos together into black picture frames from BHG at Walmart. We hung a full length mirror horizontally on the wall for interest. The new side chair is from a local furniture store, Engstrom Home Furniture. 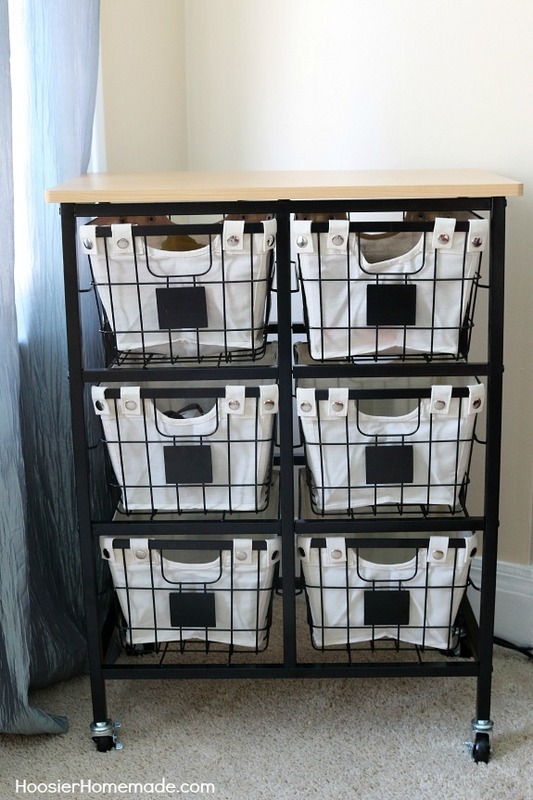 And for added storage, the Better Homes and Gardens 6-Drawer Black Wire Cart works great in the corner. I’m simply thrilled with how the bedroom makeover turned out. But we can’t forget about the bed in this gorgeous new bedroom. Here’s a little sneak peek at the new bedding that we will share soon. Are you ready to do a little shopping? 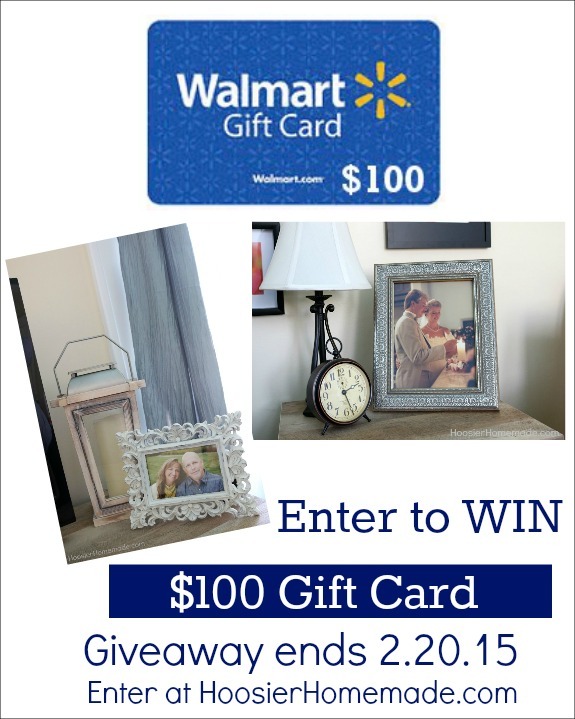 Pop on over and enter to win! For more inspiration visit Better Homes and Garden Live Better on Facebook ,Twitter, Instagram and Pinterest! Great job on the makeover! I had actually just seen the wire cart basket and love it! Practical but so cute! I love the TV stand and seating area! Very beautiful work! I love how you’ve created a sitting area for the TV instead of having it in front of the bed. It encourages you to A. Get out of the bed if you want to watch and B. Not fall asleep being stimulated by the TV. Wonderful transformation! I’m jealous of all your space! 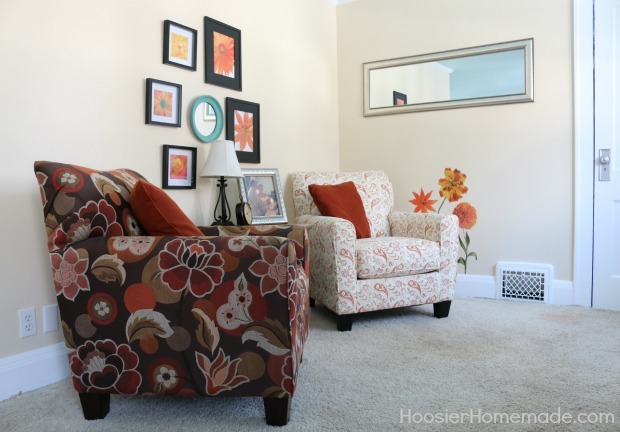 The furniture, storage and seating area are great, love your pops of color too! Love your picks!! I have the Crossmill bookcase in my kitchen and couldn’t be happier! Thanks so much Ursula! I don’t have room in my kitchen, but if I did I would for sure have one. Wow, what a transformation! I love the Crossmill collection, I have the TV stand in my dining room and it’s stunning. Thanks so much Anna! I love it too, I think we will get the other pieces for the rest of the room. Looks great! I know what that bedspread cover is! I have had it in my shopping cart for a few weeks now! Can’t wait to hear how you like the quality! Can it be washed easily? We have a dog that is up there a lot and I want to be able to throw it in the wash!